One species, of very isolated position in the family. Central Asia (Pamiro Alay), Tien Shan (Ugamskiye Mountains) and northern Afghanistan. In the forest and middle mountain zones, among shrubs, about 1,500-2,000. Flowering stem up to 100-180 cm. Leaves ovate-oblong, dentate, 2-5 in whorls along the stem. Stem and leaves glabrous. 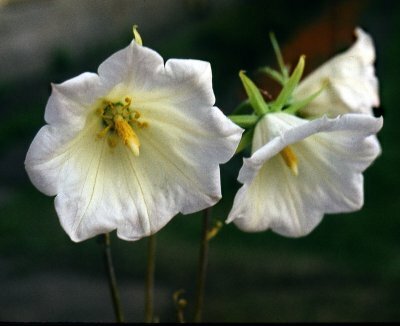 Flowers with long pedicels, white or light blue, rarely violet, large, to 16-18 cm diam., in terminal panicle. One plant can produce up to 30 flowers. V - in mountains May to September. Fl - June-July. Fr - August-September. In the foothills fl - May and all above ground parts die off by the end June. P - by seed. A slow-growing perennial, it can grow for many years in one place. Prefers sunny places, but needs to be protected from the afternoon sun. Requires a light, well-drained soil, without watering during the dormant period (from mid summer till late autumn). Can be transplanted during the autumn only (September). Z 5. This species is the gem of the family.